Euro-zone bank's stress test: stressfull for Europe? Last week European Union’s decision to publish the results of stress tests on the region’s banks was more or less imposed by the Spanish government that unexpectedly pledged to publish results on Spanish individual banks, becoming the first European government to do so. I welcome more transparency and it is the only way to fend off rumors that markets are prone to amplify. As usual, the devil will however be in the details, the quality of the test, the amount of disclosure and the number of banks included. So far, it seems that only the tests on the 25 largest banks will be disclosed; but what about the Cajas in Spain and Landesbanken in Germany that are in trouble? I have discussed several times challenges European countries are facing with their over-indebtedness. This is compounded by inadequate banks' shareholders funds, in particular with respect to their exposure to euro-zone sovereign debt and the private sector. The banks were indeed happy to earn a bit of extra yield on supposedly risk-free assets and loaded up their balance sheets with the weaker countries’ government debt. I doubt this debt is marked-to-market but held to maturity instead. The market realized this, which explains the difficulty banks have to obtain short-term financing, the interbank and commercial paper markets have frozen again which translated in the surge both in short-term financing and cash deposits at the ECB in the recent past. One may wonder who is going to buy Goverment bonds but if banks buy and immediately re-sale to the ECB in a way to avoid no loss for banks (or pre-agreed sales at pre-agreed prices? ); in some ways banks would act as an agency broker for the ECB. Contrarily to the US, European banks on the continent did not clean their balance sheets in 2008 and have remained over-leveraged. They need to be recapitalized, then the market will be convinced that there is no longer a solvency issue. The total exposure of banks in the euro zone to Portugal, Ireland, Greece and Spain amounted to USD 1,579 billion at the end of 2009, or 2/3 of all international banks' exposure (I bet it is higher today), Spain representing nearly half of the total. French and German banks were the most exposed with respectively USD 493 billion and USD 465 billion, and USD 248 billion and USD 202 billion to Spain. 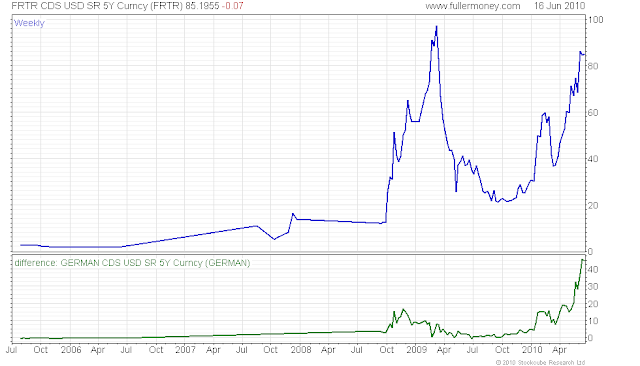 The exposure of French and German banks to Greek and Spanish government debt is USD 79 billion and USD 56 billion. The combined exposures of German, French and Belgian banks to the public sectors of Spain, Greece and Portugal amounted to 12.1%, 8.3% and 5.0% of their Tier 1 capital. By comparison, the combined exposures of Italian, Dutch and Swiss banks to the same public sectors were equal to 2.8%, 2.7% and 2.0%. A collapse of the Club Med PIGS would be disastrous for the German, French and Belgium banking sector (please note that French banks have an exposure of USD 301 billion to Belgium, by far the largest creditors). 3. Will the dark scenario materialize? The BIS conducted a study comparing current stress on markets with the 2007-2009 financial crisis. The current market stress has been associated with the same increase in equity volatility as in the second half of 2007, but Libor-OIS spreads have moved up more slowly. Despite the recent rise to around 30 basis points, three-month US dollar Libor-OIS spreads remain well below their levels from August 2007 onwards. The current rise in the VIX initially followed the July 2007 trajectory, but then jumped sharply, as it did in September 2008. While cross-currency basis swaps are signalling difficulties for banks seeking to raise US dollars, the limited participation at US dollar auctions held by the ECB, the Bank of England and the Swiss National Bank suggests that the problem is more about counterparty credit risk than access to foreign currency funding. In contrast to July 2007, the euro-US dollar basis swap began the recent period at a level suggesting that stress was already present in cross-currency funding markets. The current departure point was similar to that of early September 2008, but the spread has widened by much less this time in response to worsening market conditions. There are similarities to 2007 but not enough evidence to conclude on a soon coming crisis, based on this analysis. 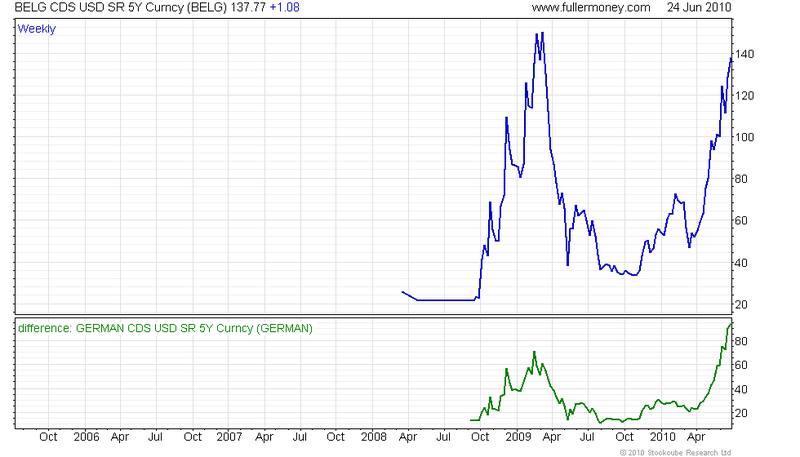 Greece, Spain, Belgium and France are reaching new highs either in absolute terms or spread with Germany or both. From left to right and top to bottom: Italy, Greece, Spain, Portugal, Ireland, France. This reflects deep uncertainty about refinancing problems for Spain on markets and continued doubts about the solvency of Greece, and the impact this would have on banks most exposed to the sovereign debt of these countries. In July, there are large euro zone sovereign financing in the turn of EUR 230 billion, including EUR 32 billion for Spain and EUR 79 billion for France (Belgium will have EUR 21 billion in September at a time when the Government should be formed; this may be tricky if the situation deteriorates in Southern Europe and France, and if the new government is not formed or if Belgium goes towards a separation between Flemish and Wallons splitting the country in two). My guess is that stress tests will be released just before these financings to show that everything is fine with the banking sector, - oops, for the 25 banks reviewed, and what about the rest (Cajas and Landesbanken in particular)? President Sarkozy of France, said that not everything should be disclosed; if information are retained from public scrutiny, expect a new and maybe fatal down-leg for the banking sector and the euro. 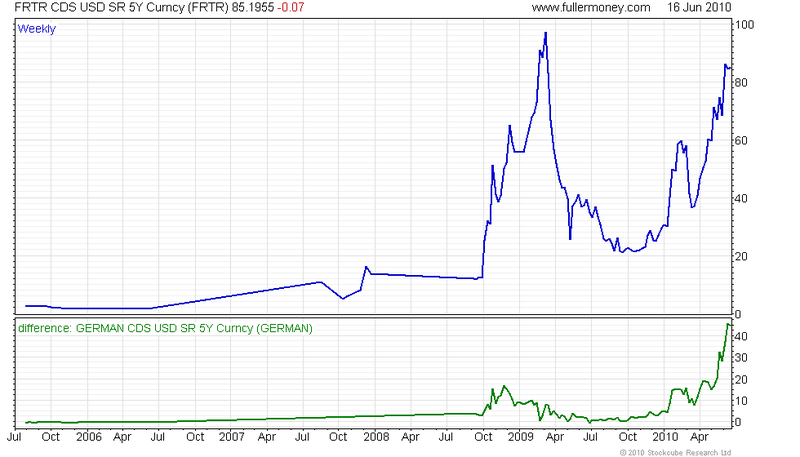 The euro is a political monster and will be defended tooth and nail by euro zone politicians, like any dogma. I however believe that facts are always right in fine and therefore I expect a new crisis to emerge in Europe within the coming months, possibly as early as July. For my subscribers, this article was sent by mistake very late yesterday: fat finger! Policy makers are diverging on prescriptions for sustaining the global recovery, with U.S. Treasury Secretary Timothy F. Geithner calling on Japan and European countries with trade surpluses to boost domestic demand, while Europe’s representatives have said reining in budget deficits was the top priority. The US is still running a large trade deficit and Europe is enjoying a trade surplus, mainly thanks to Germany. Interesting enough, some European leaders (French ones in particular) were, until recently, calling on Germany to stimulate domestic demand: on June 7th, Angela Merkel, the German chancellor, responded by a definitive nein! with the EUR 86 billion austerity package to be spread until 2014. To avoid to be too harshly punished by markets France followed suit today with a EUR 100 billion (50/50 spending cut and additional tax collection). Let's assume that all goes well and all euro-zone countries are back to 3% (which I do not believe one minute and not only for PIGS countries- for example how Ireland could divide its deficit by 4 in 3 years or Spain by 3) and therefore find EUR 100 billion a year during the 3 years to 2013, it means that the euro-zone still would have added nearly EUR 1 trillion debt, an increase in the debt/GDP ratio from 80% in 2009 to 92% in 2013, not a decrease. In addition, nothing will have been done to reduce the competitivity gap between Northern Europe and Southern Europe. All the measure adopted are aiming at avoiding the straight default of several countries and an immediate collapse of the banking sector across the euro-zone. But this is not tackling the fundamental issues and merely gaining some (and not a lot) time. The solvency issue is not dealt with, but it is clear that Germany calls the shots (for the time being), and all countries will have to follow its path or markets will be shut down for funding their financial requirements. As discussed in the previous point, deficits are being addressed to go back to the Maastricht criteria of 3% debt/GDP. I note that nothing is said about the second criteria: a maximum of 60% debt/GDP. Indeed, 3% deficit/GDP is a deficit and therefore increases the amount of debt that countries have to take on. According to Markets & Beyond calculations, fiscal deficits post austerity packages will amount to a cumulative EUR 955 billion for the 3 years ending in 2013, i.e. EUR 955 billion additional debt to reach EUR 8.5 trillion or 91% of GDP. Within this stock of public euro-zone debt, we could see some countries negatively impacted (Italy and France in particular) if PIGS countries need to tap the EUR 860 billion rescue packages (Greece + remaining euro-zone). By Domestic Private Sector Financial Balance we mean the net balance of business and consumers. Are they borrowing money or paying down debt? Government Fiscal Balance is the same: is the government borrowing or paying down debt? And the Current Account Balance is the trade deficit or surplus. The implications are simple. The three items have to add up to zero. That means you cannot have both surpluses in the private and government sectors and run a trade deficit. You have to have a trade surplus. Let's make this simple. Let's say that the private sector runs a $100 surplus (they pay down debt) as does the government. Now, we subtract the trade balance. To make the equation come to zero it means that there must be a $200 trade surplus. $50 (private debt reduction) + (-$150) (government deficit) - (-$100) (trade deficit) = 0. Remember that we are adding a negative number and subtracting a negative number. Bottom line. You can run a trade deficit, reduce government debt and reduce private debt but not all three at the same time. It means that in face of a declining population (the case for a number of European countries) you have to increase your productivity even more to keep your GDP growing. I wrote several time that the current crisis is a brutal adjustment to over-indebtedness (public and private): As a family's or country's debts grow, the carrying cost or interest expenses rise. At some point, the interest expense consumes an ever larger portion of the budget. Increasing the debt increases the interest expense eventually to the breaking point. There are limits and we have reached these limits in several countries. European countries have realized that there is no way out of the mess politicians created over the past 20 years but reducing fiscal deficits. It is worth mentioning that in today's austerity package, France will cut EUR 15 billion in planned keynesian inspired economic growth measures: Keynes is definitely dead on this side of the Atlantic under the pressure of bond vigilantes and Germany. This will cut growth (you cannot withdraw hundreds of billions from the economy and hike taxes with no consequence on GDP and employment). From the first equation, it is however possible to offset the reduction in governments' fiscal imbalances via exports and a deficit increase by the private sector. The competitive devaluation of a currency (or monetizing a currency) is a classical way to improve a trade balance (since the end of Bretton Wood, the US has consistently manipulated the dollar to its advantage). This is not panacea, but probably the least worst choice at this juncture. Within Europe there is an additional problem: euro-zone uncompetitive economies cannot devalue their currency. In addition, all PIGS's countries have large trade deficits (from 9.4% for Portugal in 2009 to 14.3% for Ireland). And Spain has an over-indebted private sector and huge unemployment: Spain is the next shoe to drop. True, the euro has declined vs all currencies from its November 2009 high (~ 20% drop) and it is translating into a better extra euro-zone trade balance which has improved since the beginning of 2010, mainly to the advantage of the traditional exporters, Germany being at the forefront. However, within the euro-zone, the competitive devaluation of the euro is neutral. Looking at the trade balance structure of the PIGS, in 2009 between 41% (Ireland) and 63% (Portugal) is intra- euro-zone trade; the scope for reducing deficits via an improvement of the terms of trade is therefore limited, beyond the fact that these countries do not have much to export outside agricultural goods, hence time needed to allow them to climb the value chain. Whilst Spain had a deficit/GPD relatively benign at the start of the financial crisis, it is spiraling following huge fiscal deficits. Uncompetitive economy: the worst euro-zone track record for unit wage costs (~+50% since 1998 vs ~8% for Germany); wage costs should fall by circa 30% to reach the German level. Large unemployment and increasing: 20.1% in Q1 2010 and 19.5% for the 20-29 age group (I also read 40% for the 18-25 age group). Debt /tax receipts approaching a dangerous zone at 185% in 2010. Large refinancing in July: EUR 31.5 billion. In addition 43% of the Spanish debt is held by foreign investors (EUR 240 billion) Q4 2009. The total net international investment position is -93.5% of GDP at the end of 2009 (-82.2% for Greece)meaning that Spain pays interest to foreign investors and the proceeds is not reinvested in Spain to the same magnitude as it would be with domestic investors (it is why the situation of Japan, despite it huge debt/GDP, is less worrying short term with over 90% of its debt held by domestic investors). Hang over in the housing market: 1.6 million unsold properties in Spain, six times the level per capita of the United States whilst prices only dropped by 10%. Total public/private debt in Spain has reached 270 percent of GDP. Fragile banking sector (The central bank seized CajaSur - savings banks are full of mortgage debt) with the interbank market shut to them. Last month, Spanish banks had to fund themselves with the ECB at the turn of €85.6bn – double the amount lent before the collapse of Lehman Brothers in September 2008 and 16.5% of net eurozone loans offered by the central bank. Today, Spain announced that they want stress tests for Spanish banks to be disclosed, a step towards transparency to alleviate market conjecture. Funding is frozen for most of the private sector. Spain's external debt has reached EUR 1.5 trillion (174% GDP), most of it on short term maturities, with EUR 600 billion due this year. All this is resulting into a sharp increase in the cost of funding of Spain as evidenced by Tuesday's auction where yields on one-year debt reached 2.45% compared to 0.9% as recently as April and a surge in the cost of CDS (Credit Default Swaps) close to 250 basis points, not far from the high reach June 7th. The positive note is that Spain can finance itself on markets as exemplified by today's successful bond sales (EUR 3.5 billion). Officials across Europe are in denial, in a remake of what happened for Greece. "To maintain debt solvency Spain must squeeze public spending: yet this policy undermines the chances of recovery which itself causes further loss of confidence"
Since Spain cannot devalue the euro to immediately improve its competitiveness, it has to reduce wages, risking to trigger a slow death by debt deflation. The choice is either reflation accepted by the ECB (which seems to be the case, at least for the time being) or Spain will be forced out of euro-zone, setting off a catastrophic chain-reaction through north Europe's banking system. The third choice is a debt moratorium for 10-15 years to give time to Spain (and other countries) to adjust their competitiveness. Jacques Attali in a recent book "Tous ruinés dans dix ans", proposes to set-up a European Agency that would issue debt in the name of Europe and guaranteed by all euro-zone members. This would imply an automatic solidarity amongst countries avoiding the unprepared cacophony we have heard for 6 months now (the result of a flawed euro-zone construction). However, this would add an other level of debt issuance where each tax payer in each euro-zone country would eventually be responsible for. Refinancing all existing debts at the country level via such an Agency would be a solution to avoid the punishing financing costs of the PIGS countries; it would however mean that Northern Europe would subsidize Southern Europe and therefore Southern Europe should give away some sovereignty to ensure that appropriate reforms are conducted and budgets respected. There is a long way to get there and time is running short. Interestingly enough is the CDS spread for France: it has gone up steadily to reach a level more than double what it was late March. Even more striking, France is the only country of the euro-zone where the spread vis-à-vis Germany is at historic high. For quite a while, I mentioned that France is in a worse shape than face value, and after Spain, I believe that it is France that will be under pressure as much as Italy, if not more. The second leg of the financial crisis is unraveling with the sovereign debt crisis in Europe: we are at the beginning and not at the end. The ECB will continue to monetize the PIGS sovereign debt which it will not sterilize despite what has been announced, to shore up French and German banks which together hold EUR 455 billion of Spanish, Portuguese and Greek debt according to RBS. A combination of euro zone economy slow down during H2 2010 and in 2011 compared to previous forecasts combined to substantially higher funding costs for PIGS countries, a freeze of the interbank market for PIGS's banks make a sovereign debt rescheduling inevitable. I do not understand how politicians believe that 20 years of lax monetary policy and over-indebtedness that followed can be solved in 3-4 years in a weak economic environment and structural reform to be implemented: time is needed and insolvency must be faced instead of living in constant denial. I re-iterate that Europeans will suffer a markedly decrease in their living standards for probably at least 10 years. In any case, in an open world where goods, people and money are free to move, how Europeans could believe that they could sustain the competition from Asia and Latin America without adjustment? The West as a whole has transferred a massive amount of wealth over the past 10 years to Asia and the Middle East, representing trillions of dollars that were then lent to the West to consume beyond their means: today, we have to pay the bill, and it is very expensive. I continue to stay clear from the banking sector and I am considering re-entering euro shorts (probably when we get closer to the Spanish refinancing) together with financial shorts. I remain long gold, commodity and energy stocks. I am contemplating getting into consumer stocks in Asia. For the rest, the S & P 500 support level held well which is positive. However, any meltdown (which is a real possibility until euro-zone politicians admit that the EUR 860 billion package did not solve the solvency problem of PIGS countries) within the euro-zone would trigger shock waves to other markets, and among them commodity driven ones and the US are the most fragile. I am just posting an excerpt from the Ludwig von Mises Institute which I felt very relevant about the Greek bailout. Can this €110 billion bailout of Greece, combined with the €750 billion of additional promised support, stop the sovereign-debt crisis, or have we crossed the point of no return? There are several reasons why political solutions may be incapable of stopping the spread of the sovereign-debt crisis. 1. The €110 billion granted to Greece may itself not be enough. What happens if in three years Greece has not managed to reduce its deficits sufficiently? Greece does not seem to be on track to becoming self-sufficient in just three years: it is doing, paradoxically, both too little and too much to achieve this. It is doing too much insofar as it is raising taxes, thereby hurting the private sector. At the same time, Greece is doing too little insofar as it is not sufficiently reducing its expenditures. In addition, strikes are damaging the economy and riots endanger the austerity measures. 2. By spending money on Greece, fewer funds are available to bail out other countries. There exists a risk for some countries (such as Portugal) that not enough money will be available to bail them out if needed. As a result, interest rates charged on their now-riskier bonds were pushed up. Although the additional €750 billion support package was installed in response to this risk, the imminent threat of contagion was stopped at the cost of what will likely be higher debts for the stronger EMU members, ultimately aggravating the sovereign-debt problem still further. 3. Someone must eventually pay for the EMU loan at 5 percent to Greece. (In fact, the United States is paying for part of this sum indirectly through its participation in the IMF.) As the debts of the rest of the EMU members increase, they will have to pay higher interest rates. Portugal is paying more for its debt already and would currently lose outright by lending money at 5 percent interest to Greece. As both total debts and interest rates for Portugal increase, it may soon reach the point where it cannot refinance itself anymore. If Portugal is then bailed out by the rest of the EMU, debts and interest rates will be pushed up for other countries still further. This may knock out the next weakest state, which would then need a bailout, and so on in a domino effect. 4. The bailout of Greece (and the promise of support for other troubled member states) has reduced incentives to manage deficits. The rest of the EMU may well think that they, like Greece, have a right to the EMU's support. For example, since interest rates may stabilize following the bailout, pressure is artificially removed from the Spanish government to reduce its deficit and make labor markets more flexible — measures that are needed but are unpopular with voters. Sovereign-debt problems, therefore, may have reached a point beyond remedy — short of default or high rates of inflation. It is likely that with the bailout of Greece we have already passed this point of no return. Latest data from the US economy points towards a weakening growth and the employment numbers were particularly weak: 411,000 out of 431,000 new jobs were temporary ones for the 2010 census. I view this report as non-significant and it does not change much the fundamentals (I don't care whether the numbers were much worse thane expected by economists - Goldman's ones in particular who were at +600.000: they must have made some nice trading profits by going short before the release). The Commercial and Industrial Loans at All Commercial Banks, that I follow closely, improved for the first time since November 2008 at +USD 6.5 billion in April. This number is significant. On 23rd March, I was indicating that we were at or near a trough for banks' lending: this confirms my view. Gowth will not continue at the annualized pace witnessed at the end of 2009, but I expect it to be in the 2.5 - 3% region for 2010 even if H2 will be slower due to the weakening euro that will hurt exports and a domestic situation that remains fragile. The sick man of the world economy is Europe. Things are really getting ugly here. Politicians are very much behind the curve of events blinded by their dogmatic view of the construction of the euro-zone and the EU as a whole. Very difficult for them to admit they have been dead wrong for the past 20 years. It is much easier to attack markets and point the finger at scapegoats. Yesterday's cancellation of a dinner between the French President, Nicolas Sarkozy, and the German Chancellor, Angela Merkel, is to me a confirmation of the deep rift between the two engines of the European construction. Germans had enough. I will write quite extensively on Europe in the coming days.